Douglas Waters developed vision problems almost three years ago. It turns out he was suffering from with severe wet age-related macular degeneration (AMD). The eye condition causes blurred vision or a blind spot. A few months after receiving his diagnosis he was selected to take part in a clinical trial at Moorfields Eye Hospital in London. A stem cell-based treatment gave Waters his sight back; now he can read the newspaper. 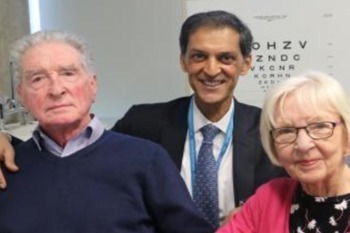 "We've restored vision where there was none," said Professor Lyndon da Cruz, a retinal surgeon at Moorfields Eye Hospital NHS Foundation Trust. "It's incredibly exciting. As you get older, parts of you stop working and for the first time we've been able to take a cell and make it into a specific part of the eye that's failing and put it back in the eye and get vision back." If you are experiencing vision loss, please contact SDCB.